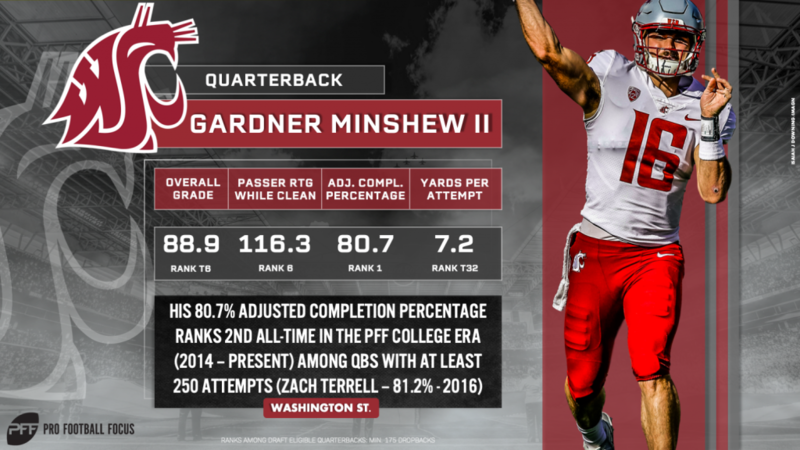 Gardner Minshew isn’t entering the 2019 NFL Draft with the media fawning over his measurables, athleticism or arm talent. Instead, he’s keeping his perceived ceiling low and seating a stadium’s worth of doubters. But he isn’t losing any sleep over it. Minshew gave everyone a taste of just how ready he is with his career year in Mike Leach’s offense with Washington State, as the 22-year-old graduate transfer finished the 2018 season ranked seventh in passing grade (89.1) and first in adjusted completion percentage (80.7%) among draft-eligible signal-callers. He also ranked third in the class in turnover-worthy play percentage (1.69%), recording just 12 turnover-worthy plays across his 708 dropbacks. But Minshew isn’t focused on what he did well a year ago. Instead, he’s spending copious amounts of time improving his weaknesses and preparing mentally for NFL. He asked every team he met with at the 2019 NFL Scouting Combine what he needed to do now to get better before the draft and has taken their suggestions to heart. NFL teams were less concerned with Minshew’s arm strength than the media, saying he had “plenty of arm” and that he met the NFL threshold. Teams also said he makes up for not having the best arm in the draft with his ability to move progressions quickly. As such, the response Minshew constantly received when he asked how to improve involved him attacking the NFL learning curve early on. Mastering the mental side of the quarterback position is easier said than done, and Minshew, like all quarterbacks going off to the NFL, faces an uphill battle in that regard. Where Minshew does have the advantage over other quarterbacks in the 2019 class is in the accuracy and ball placement department, traits that really can’t be taught at the next level. A whopping 77.8% of Minshew’s pass attempts were charted as either accurate+ or accurate in 2018, which ranked eighth among draft-eligible quarterbacks with 300 or more passes. He also had the lowest percentage of uncatchable inaccurate passes (13.05%) among the same group of 65 quarterbacks. NFL teams shared our opinion of Minshew’s accuracy, calling out his accuracy, timing and throw anticipation as key strengths. His commitment to preparation combined with his impressive accuracy bodes well for his floor in the NFL, and as for the height of his ceiling, he should surprise many with just how high he climbs at the next level.